Unique Lamina™ construction maximizes the loft of your insulation, eliminates cold spots and thermally maps insulation to areas you need the most warmth. By strategically placing insulation, Mountain Hardwear is able to concentrate warmth where you need it most - around your core and feet. The comfort mummy fit of this 5°F/-15°C -rated bag offers room to move while remaining thermally efficient. Unique Lamina™ construction maximizes the loft of your insulation, eliminates cold spots and thermally maps insulation to areas you need the most warmth. By strategically placing insulation, Mountain Hardwear is able to concentrate warmth where you need it most - around your core and feet. The comfort mummy fit of this 5°F/-15°C -rated bag offers room to move while remaining thermally efficient. It also features a draft collar and their exclusive welded Lamina™ construction that maximizes loft and eliminates cold spots caused by traditional stitching. Soft polyester lining wicks away moisture and lightweight nylon shell repels water. Full-length zipper has double sliders for ventilation. Thermal.Q® is warmer because it&apos;s designed to mimic the structure of goose down - rigid stems that form a matrix of gaps and softer fibers to fill those gaps. Thermal.Q® uses stiffer fibers to create a unique 3D grid structure and finer fibers to fill in the gaps the structure creates. The result is a warmer synthetic whose structure gives it better compression rebound. 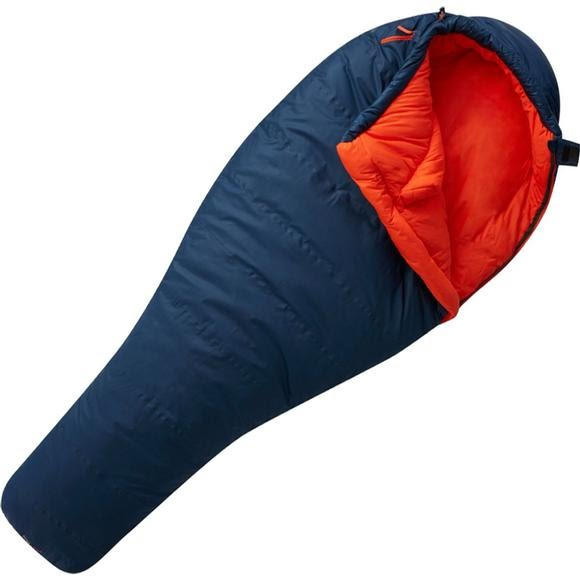 Length Reg: 78", Long: 84"
Shoulder Reg: 63", Long: 65"
Hip Reg: 59", Long: 64"
Foot Reg: 41", Long: 43"
Stuffsack Size 9" x 18"